For starters, we had the Jamaican style fish cakes ($14). I found the composition to be light and crumbly, and the jerked tartar aioli really helped bring out the flavour of the white fish–otherwise it almost tasted like any other fish cake. The crispness of the lettuce and carrot salad was fantastic and I suspect these were locally grown. For the main meal, both James and I had the same thing, the Fireside Fish Pot ($18). This bowl of gold was the reward we were waiting for. The luck of the Irish was with me today. If there were fairies dancing around, they would be Raven St. Market Cafe’s many attractive female servers. Also, the freshly made focaccia bread certainly had me dancing on cloud nine. The bread was light and fluffy. With garlic butter on top of this toasted delight, I had to resist the urge to simply wolf it down. 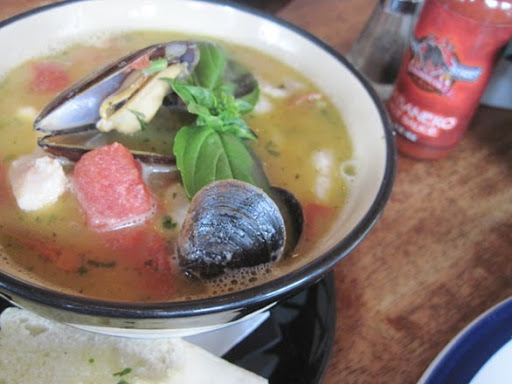 The portions of mollusk (mussel) and crustacean (prawn) made for a delectable broth. With a hint of basil, paprika and the holy trinity of Cajun cooking mixed in, the silky broth cooked the catfish to a tender firmness. I really have to try this fish again seared, but this bowl gave me a taste of everything that I wanted on the first visit. J: The catfish melted like butter in my mouth. The broth of the soup itself was very invigorating. But I was disappointed with only two slices of bread offered per serving. I would’ve paid at least a dollar more for another piece. Perhaps in the future they should add a small basket of this bread as an appetizer in their menu. E: I’d buy the bread, some local ingredients, and take it to the park for a picnic by the sea. My only little complaint with the Fireside Fish Pot was with the size of the prawns. They may be local, but they’re just average-sized morsels. As delectable as they are, it didn’t help make this meal stand out. The mussels were just as basic. Now if this place went jumbo, or used crawfish, I’d be moving to this neck of the woods. Instead, how the broth was made proved to be the high point. 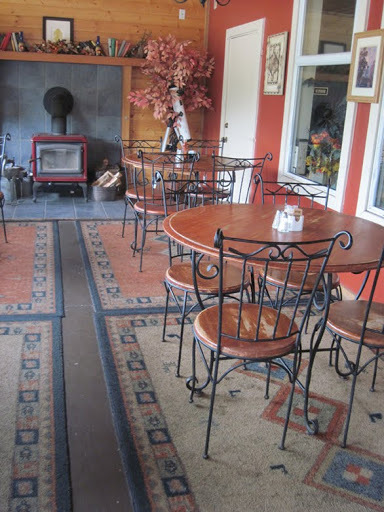 J: Raven Cafe is known both locally and internationally for their wood fire cooked meals. You can taste the difference when compared to gas or electricity. The basal came as a decorative piece but I found it more rewarding to let it soak. The further down the broth I sipped, the better the flavour became–until I was scooping the leaves up in my spoon. As I sat there, I couldn’t help but overhear a group of elderly women from Great Britain mention such things as One Foot In the Grave, starring Richard Wilson. I wished I could’ve sat down for a chinwag with the dears but instead I was conducting Beethoven’s Symphony No. 5 with only the flies as my audience. I’m afraid that’s the drawback to eating in the covered but accessible patio at Raven Cafe. This entry was posted in Uncategorized and tagged British Columbia, Jamaican, Pub Food, Salt Spring, West Coast. Bookmark the permalink.